Which is more dangerous, a gun or a swimming pool? What do schoolteachers and sumo wrestlers have in common? Why do drug dealers still live with their moms? How much do parents really matter? How did the legalization of abortion affect the rate of violent crime?These may not sound like typical questions for an econo-mist to ask. But Steven D. Levitt is not a typical economist. He is a much-heralded scholar who studies the riddles of everyday life—from cheating and crime to sports and child-rearing—and whose conclusions turn conventional wisdom on its head. Freakonomics is a groundbreaking collaboration between Levitt and Stephen J. Dubner, an award-winning author and journalist. They usually begin with a mountain of data and a simple question. Some of these questions concern life-and-death issues; others have an admittedly freakish quality. Thus the new field of study contained in this book: freakonomics.Through forceful storytelling and wry insight, Levitt and Dubner show that economics is, at root, the study of incentives—how people get what they want, or need, especially when other people want or need the same thing. 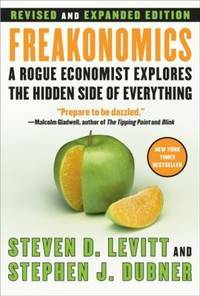 In Freakonomics, they explore the hidden side of . . . well, everything. The inner workings of a crack gang. The truth about real-estate agents. The myths of campaign finance. The telltale marks of a cheating schoolteacher. The secrets of the Klu Klux Klan. What unites all these stories is a belief that the modern world, despite a great deal of complexity and downright deceit, is not impenetrable, is not unknowable, and—if the right questions are asked—is even more intriguing than we think. All it takes is a new way of looking. Freakonomics establishes this unconventional premise: If morality represents how we would like the world to work, then economics represents how it actually does work. It is true that readers of this book will be armed with enough riddles and stories to last a thousand cocktail parties. But Freakonomics can provide more than that. It will literally redefine the way we view the modern world. William Morrow. Hardcover. POOR. Noticeably used book. Heavy wear to cover. Pages contain marginal notes, underlining, and or highlighting. Possible ex library copy, with all the markings/stickers of that library. Accessories such as CD, codes, toys, and dust jackets may not be included. William Morrow. Used - Acceptable. All orders guaranteed and ship within 24 hours. Your purchase supports More Than Words, a nonprofit job training program for youth, empowering youth to take charge of their lives by taking charge of a business. William Morrow, 2006. Hardcover. Good. Disclaimer:A copy that has been read, but remains in clean condition. All pages are intact, and the cover is intact. The spine may show signs of wear. Pages can include limited notes and highlighting, and the copy can include previous owner inscriptions. At ThriftBooks, our motto is: Read More, Spend Less.Dust jacket quality is not guaranteed. William Morrow, 2006. Hardcover. Acceptable. Disclaimer:A readable copy. All pages are intact, and the cover is intact. Pages can include considerable notes-in pen or highlighter-but the notes cannot obscure the text. At ThriftBooks, our motto is: Read More, Spend Less.Dust jacket quality is not guaranteed. William Morrow, 2006. Hardcover. Acceptable. Disclaimer:A readable copy. All pages are intact, and the cover is intact. Pages can include considerable notes-in pen or highlighter-but the notes cannot obscure the text. An ex-library book and may have standard library stamps and/or stickers. At ThriftBooks, our motto is: Read More, Spend Less.Dust jacket quality is not guaranteed. William Morrow, 2006. Hardcover. Good. Disclaimer:A copy that has been read, but remains in clean condition. All pages are intact, and the cover is intact. The spine may show signs of wear. Pages can include limited notes and highlighting, and the copy can include previous owner inscriptions. The dust jacket is missing. At ThriftBooks, our motto is: Read More, Spend Less. William Morrow. Hardcover. 0061234001 Missing dust jacket. Meets the acceptable condition guidelines. Has wear. Five star seller - Buy with confidence! . Fair. William Morrow. Used - Very Good. Great condition for a used book! Minimal wear. William Morrow. Used - Very Good. Ships from Reno, NV. Great condition for a used book! Minimal wear. 100% Money Back Guarantee. Shipped to over one million happy customers. Your purchase benefits world literacy! William Morrow. Used - Good. Ships from Reno, NV. Former Library book. Shows some signs of wear, and may have some markings on the inside. 100% Money Back Guarantee. Shipped to over one million happy customers. Your purchase benefits world literacy! William Morrow. Hardcover. 0061234001 Has heavy shelf wear, but still a good reading copy. Does not have dust jacket. Over 1,000,000 satisfied customers since 1997! We ship daily M-F. Choose expedited shipping (if available) for much faster delivery. Delivery confirmation on all US orders. . Good. October 2006. William Morrow, 2006-10-02. Hardcover. Very Good. William Morrow, 2006-10-02. Hardcover. Very Good. First edition. William Morrow. Hardcover. 0061234001 Book is clean. Crisp pages. Tight binding. Slight shelf wear on dust jacket. Good reading copy. Tanning throughout. . Very Good. New York: William Morrow & Co., 2006. Revised and Expanded Edition . Hardcover. Near Fine/Near Fine. 8vo - over 7¾ - 9¾" tall. Includes Index. Minor shelf wear, otherwise fine condition. William Morrow & Co, 2006. Hardcover. Good. Hardcover. Sound & good copy, light to moderate edgewear, clipped at inside first page. Jacket has light to moderate rubbing/edgewear. Not price clipped. William Morrow, 2006-10-02. Hardcover. Very Good. Excellent condition. Interior is tight, bright and clean; no underlining, notes or highlighting. Hard covers are tight and stiff. Missing original paper dust cover. 100% Satisfaction Guaranteed. All items are carefully enclosed with bubble wrap. We ship promptly and worldwide via US Post and will email you a tracking number. William Morrow. Collectible - Very Good. Signed Copy Collectible - Very Good. Good dust jacket. Signed/Inscribed by Dubner on half title page.